* today is the december synchroblog, different bloggers writing on the same topic. the link list is at the bottom of this post. we are partnering with christine sine’s advent series all month called coming home. the first thought when i heard about this series was a post i wrote earlier this year for sheloves magazine called mobile homes (not that kind). in the spirit of advent and Jesus’ mobile-home-ness and the realities, i thought i’d share it here as part of this month’s theme. whenever i post things i write from other places, you also get to enjoy capital letters! Growing up, I lived with a prevailing feeling I like to call “never being comfortable in my own skin or my own home.” My mom was a single mom, doing the best she could, despite the obstacles. My dad, a sweet and kind man but a severe alcoholic, always lived in another state from us, renting rooms from people or living in a camper. When I was in late elementary school I inherited a stepfather who had a positive (a stable job, so we owned a house for the first time) and a lot of negatives (he, too, drank a lot, but definitely wasn’t sweet and kind). My role in the family was to be the glue that kept everything together. Keep the peace, be good, do good—this was my coping mechanism. The problem was that inside, I was sort of falling apart. I wanted someone to be glue for me. I wanted to feel comfortable in my skin. I wanted to feel “at home” in my house. I wanted to feel “at home” in my heart. After graduating from high school, I left for college in another state, my car packed to the brim with most of my belongings. My mom ended up finally separating from my stepdad and selling the only house I remembered living in. Looking back, I realize now I had already been homeless, even before the house was gone. Spiritually and emotionally homeless. After college I got married and started seeking God in more intentional ways. I also began to address some of the issues from my past. Really, most of them lead to that feeling of being emotionally homeless, displaced, lonely, never secure. Since then God has continued to do all kinds of crazy things in my life to bring healing and life into these dark places of my story. As I continue to heal, I feel more and more at home in my own skin. And, I have worked to create a home for my family and friends that is safe and loving for those who enter. There are a lot of “homeless” people who live in houses. Men and women of all shapes, sizes, experiences, educations, faith backgrounds, ages, and colors who feel spiritually and emotionally homeless. Displaced. Disconnected. Unloved. With no sense of belonging or safety. Some have been in churches for years, but have never felt the deep and meaningful connection with other people and God they long for. Others have never felt safe in a church for all kinds of reasons. Whatever the reason, feeling “home” has eluded. When Jesus entered the world as a little baby, he had “no place to lay his head.” Then, when he left home and entered public ministry, it was the same. However, his life was filled with friends, relationships, interactions with crazy people, weird parties, and a deep, passionate, intimate connection with God, the Father. He was home, without a home. Because He was a home. A mobile home. A person who created a sense of safety and belonging and healing for those around Him, wherever He went. Jesus left us with his example. I think that’s what the incarnation of Christ is supposed to be—we are called to be mobile homes, people who create a sense of safety and love and hope in the places we go. We don’t have to be fully healed to create it. We don’t have to have all of our ducks in a row or our Scripture verses properly memorized. We don’t have to meet some magical bar in the sky that says what qualifies us. I think “home” can be created in ways that have nothing to do with four walls and a roof in a specific part of town. Home is our hearts being connected to each other in a tangible way. Home is a relationship that restores dignity, beauty, value where there once was none. Home is a shared meal and a meaningful conversation about God and life that stirs the soul. Home is the safety of showing the reality of the brokenness in our lives and having people not ditch us. Home is a shared experience that makes us think. Home is a desperate hug reciprocated. 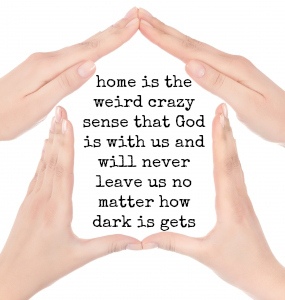 Home is the weird crazy sense that God is with us and will never leave us, no matter how dark it gets. My hope on this downward path of living out the wild ways of Jesus is that in each of our own unique ways, we would become these kinds of mobile homes. People sent out in a broken and disconnected world to somehow create a strange and beautiful sense of belonging wherever we go. People of hope. People of love. People of presence. People who are beginning to feel more at home in our own skin and can help others feel more “home,” too. Love this, Kathy … I very much believe that the dwelling place Jesus left to prepare as our “home” was the reality that Father, Son and Spirit would be making their home in each human heart. Our bodies are the structure of that home — their presence fills it with light and love and grace and mercy, makeing it our true home … our mobile home for this Kingdom journey. Love being in the “caravan” with you, sister! Just this last week or so, I’ve become aware of how much healing I have been through in the last year which enables me now to talk about thing which previously I was not able to. It helps to have a sense that I have (whether I am right or wrong in that) that you get it, you understand. If I am right in this then this is a precious gift you give to people to be that for them. Be encouraged! So yes I guess you could call that “therapy” too – it gets the anger out and released! So yeah – I like what you say with the “home is” comments, just as I liked what you said about a “healing balm” recently. Thank you. i was reminded this week with a reference to the beatitudes about God being close to the broken-hearted. Comfort not necessarily being felt at such times but there being times of greatest awareness (perhaps the intensity of emotions being significant in this) of when there being the greatest awareness of God having things covered and in his provision. Pingback: Is There Room For Jesus To Find a Home In Your Heart? One evening at a party in a church member’s home, one person mentioned the “church family”. A single man in the group said the church didn’t feel like a family to him. Most people spoke up and agreed. The pastor and leadership got wind of the discussion and got upset. Church has never felt like “home” to me. However, we have a handful of Christian friends we did not meet “in church” who do feel like family. Maybe it’s based on common interests rather than sitting in a chair listening to a speech (sermon) we never remember while looking at the back’s of people’s heads. So sometimes I want to serve an eviction notice to the inhabits of my resident mobile home.. Since that isn’t going to happen and one perhaps just needs to deal with it 🙂 This is a task that I am going to continue to strive towards- to feel more comfortable in my home, so that inviting others over doesn’t feel like a Mary/Martha guilt war. I will take even a *little* more safe in mi casa. i always love your metaphors. thanks for sharing your heart. Kathy – Beautiful and challenging! I love the your pain has morphed into a beautiful compassion! I love this and all the examples you give of how to create that “at home” feeling for others! It’s the perfect time of year for us to focus on how we can make others feel like they are at home when they are with us!